This Level-2 (L2) soil moisture product provides estimates of global land surface conditions retrieved by the Soil Moisture Active Passive (SMAP) passive microwave radiometer during 6:00 a.m. descending and 6:00 p.m. ascending half-orbit passes. SMAP L-band brightness temperatures are used to derive soil moisture data, which are then resampled to an Earth-fixed, global cylindrical 36 km Equal-Area Scalable Earth Grid, Version 2.0 (EASE-Grid 2.0). Level-1B water-corrected brightness temperatures are used in passive soil moisture retrieval. This procedure corrects for anomalous soil moisture values seen near coastlines in the previous version and should result in less rejected data due to waterbody contamination. Five new data fields accommodate this correction: grid_surface_status, surface_water_fraction_mb_h, surface_water_fraction_mb_v, tb_h_uncorrected, and tb_v_uncorrected. Improved depth correction for effective soil temperature used in passive soil moisture retrieval; new results are captured in the surface_temperature data field. This correction reduces the dry bias seen when comparing SMAP data to in situ data from the core validation sites. Frozen ground flag updated to reflect improved freeze/thaw detection algorithm, providing better accuracy; new results are captured in bit 7 of the surface_flag. Data Contributor(s): O'Neill, P. E., S. Chan, E. G. Njoku, T. Jackson, and R. Bindlish. O'Neill, P. E., S. Chan, E. G. Njoku, T. Jackson, and R. Bindlish. 2018. SMAP L2 Radiometer Half-Orbit 36 km EASE-Grid Soil Moisture, Version 5. [Indicate subset used]. Boulder, Colorado USA. NASA National Snow and Ice Data Center Distributed Active Archive Center. doi: https://doi.org/10.5067/SODMLCE6LGLL. [Date Accessed]. Surface soil moisture (0-5 cm) in cm3/cm3 derived from brightness temperatures (TBs) is output on a fixed global 36 km EASE-Grid 2.0. Also included are brightness temperatures in kelvin representing the weighted average of Level-1B brightness temperatures whose boresights fall within a 36 km EASE-Grid 2.0 cell. For a complete list of file contents for the SMAP Level-2 radiometer soil moisture product, refer to the Data Fields page. All data element arrays are one-dimensional, with the exception of landcover_class and landcover_class_fraction, which are two-dimensional arrays. This group contains soil moisture data, ancillary data, and quality assessment flags. Corrected brightness temperatures are also provided. For these brightness temperatures (such as tb_3_corrected), an additional procedure has been applied to correct for anomalous water and land values; see the Water/Land Contamination Correction section for details. [Orbit#] 5-digit sequential number of the orbit flown by the SMAP spacecraft when data were acquired. Orbit 00000 began at launch. Orbit numbers increment each time the spacecraft flies over the southernmost point in the orbit path. Refer to the SMAP Data Versions page for version information. Each half-orbit file is approximately 3 MB. The daily data volume is approximately 42 MB. Coverage spans from 180°W to 180°E, and from approximately 85.044°N and 85.044°S for the global EASE-Grid 2.0 projection. The gap in coverage at both the North and South Pole, called a pole hole, has a radius of approximately 400 km. 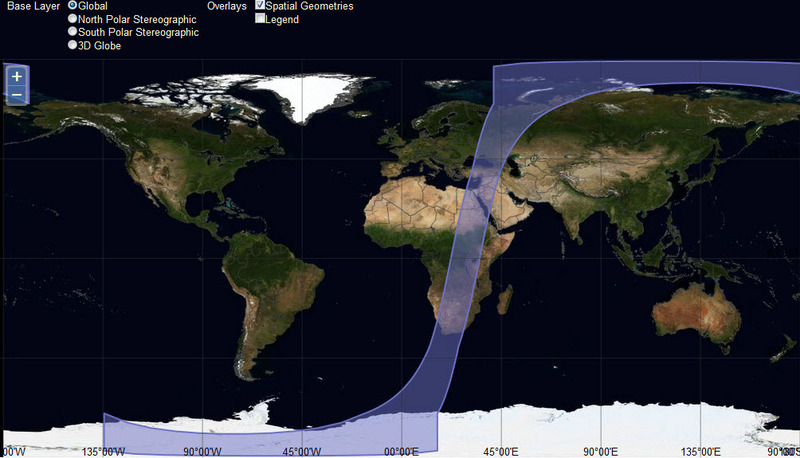 The swath width is approximately 1000 km, enabling nearly global coverage every two to three days. The native spatial resolution of the radiometer footprint is 36 km. Data are then gridded using the 36 km EASE-Grid 2.0 projection. These Level-2 data are provided on the global cylindrical EASE-Grid 2.0 (Brodzik et al. 2012). 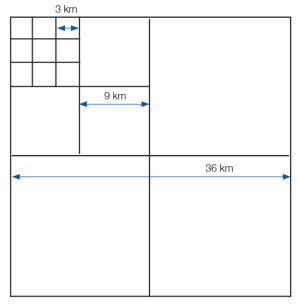 Each grid cell has a nominal area of approximately 36 x 36 km2 regardless of longitude and latitude. EASE-Grid 2.0 has a flexible formulation. By adjusting a single scaling parameter, a family of multi-resolution grids that nest within one another can be generated. The nesting can be adjusted so that smaller grid cells can be tessellated to form larger grid cells. Figure 3 shows a schematic of the nesting. This feature of perfect nesting provides SMAP data products with a convenient common projection for both high-resolution radar observations and low-resolution radiometer observations, as well as for their derived geophysical products. For more on EASE-Grid 2.0, refer to the EASE-Grid 2.0 Format Description. The following tables provide information for geolocating this data set. Each Level-2 half-orbit file spans approximately 49 minutes. For an in-depth description of the theory of these measurements, refer to Section 2: Passive Remote Sensing of Soil Moisture in the Algorithm Theoretical Basis Document (ATBD) for this product (O'Neill et al. 2018). SMAP Level-2 radiometer soil moisture data (SPL2SMP) are derived from SMAP L1C Radiometer Half-Orbit 36 km EASE-Grid Brightness Temperatures, Version 4 (SPL1CTB). SMAP Level-2 radiometer soil moisture data (SPL2SMP) are derived from SMAP L1C Radiometer Half-Orbit 36 km EASE-Grid Brightness Temperatures, Version 4 (SPL1CTB). Utilizing a baseline plus four optional soil moisture algorithms discussed below, SMAP brightness temperatures are converted into an estimate of the 0-5 cm surface soil moisture in units of m3/m3. The following information has been adapted from O'Neill et al. 2016 and O'Neill et al. 2018. The main input to the processing algorithm for this product is the SMAP L1C Radiometer Half-Orbit 36 km EASE-Grid Brightness Temperatures, Version 4 (SPL1CTB) product. The product contains time-ordered, geolocated, and calibrated SMAP L1B Radiometer Half-Orbit Time-Ordered Brightness Temperatures (SPL1BTB), Version 4 that have been resampled to the fixed 36 km EASE-Grid 2.0. In addition to general geolocation and calibration, the Level-1B brightness temperature data have also been corrected for atmospheric effects, Faraday rotation, and low-level RFI effects prior to regridding. If the RFI encountered is too large to be corrected, the brightness temperature data are flagged accordingly and no soil moisture retrieval is attempted. Refer to the SPL1BTB and SPL1CTB ATBDs for additional details. For this Version 5 product, the input SPL1CTB brightness temperature data have been corrected for cases where a significant percentage of the grid cell contains a mix of land and open water. This procedure corrects for anomalous soil moisture values seen near coastlines in the previous version and should result in less rejected data due to waterbody contamination. The correction is performed in the SPL1BTB Version 4 product at the footprint level using the SMAP radiometer antenna gain pattern. When the antenna-gain-weighted water fraction within the antenna field of view (FOV) is less than or equal to 0.9, and when the antenna boresight falls on a land location as indicated by a static high-resolution land/water mask, the correction is applied. Conversely, when the antenna boresight falls on a water location, and when the water fraction within the antenna field of view (FOV) is greater than or equal to 0.1, the correction is applied. Over land, the resulting brightness temperatures will become warmer upon the removal of the contribution of water compared to the original uncorrected observations. Further details are provided in the Water/Land Contamination Correction section of the SPL1BTB user guide. In addition to brightness temperature observations, the SPL2SMP algorithm requires ancillary data sets for soil moisture retrieval. The specific parameters and sources of these and other externally provided ancillary data are listed in Section 6: Ancillary Data Sets of the ATBD (O'Neill et al. 2018). In order for soil moisture to be retrieved accurately, a variety of global static and dynamic ancillary data are required. Static ancillary data are data which do not change during the mission, while dynamic ancillary data require periodic updates in time frames ranging from seasonally to daily. Static data include parameters such as permanent masks (land, water, forest, urban, mountain, etc. ), the grid cell average elevation and slope derived from a Digital Elevation Model (DEM), permanent open water fraction, and soils information (primarily sand and clay fraction). Dynamic ancillary data include land cover, surface roughness, precipitation, vegetation parameters, and effective soil temperatures. Ancillary data are also employed to set flags that help to determine either specific aspects of the processing, such as corrections for open water and frozen ground, or the quality of the retrievals, such as the precipitation flag. Refer to the Data Flags section below. All input data to the SPL2SMP process are pre-mapped using the 36 km EASE-Grid 2.0 projection. Other parameters used by the SPL2SMP algorithm include a freeze/thaw flag, an open water fraction, and a vegetation index. All input brightness temperatures and ancillary data sets used in the retrievals are mapped to the 36 km EASE-Grid 2.0 prior to entering the SPL2SMP processor. All input data, retrieved soil moisture data, and flags utilize the same grid. The primary contents of SPL2SMP data are the retrieved soil moisture and associated Quality Assessment (QA) flags, as well as the values of the ancillary parameters needed to retrieve the output soil moisture for that grid cell. Decades of research by the passive microwave soil moisture community have resulted in a number of viable soil moisture retrieval algorithms that can be used with SMAP brightness temperature data. The European Space Agency (ESA) Soil Moisture and Ocean Salinity Mission (SMOS) mission currently flies an aperture synthesis L-band radiometer which produces brightness temperature data at multiple incidence angles over the same ground location. The baseline SMOS retrieval algorithm is based on the tau-omega model described in the ATBD, Section 2.1: Physics of the Problem (O'Neill et al. 2018), but utilizes the SMOS multiple-incidence-angle capability to retrieve soil moisture. SMAP retrievals are also based on the tau-omega model, but use the constant-incidence-angle brightness temperature data produced by the SMAP conically-scanning radiometer. As mentioned above, other necessary parameters in the retrieval are obtained as ancillary data. Prior to implementing the actual soil moisture retrieval, a preliminary step in the processing is to perform the water/land contamination correction described above. This Version 5 product also includes an improved depth correction scheme for the effective soil temperature (i.e. the surface_temperature field), which is a critical parameter in passive soil moisture retrieval. This correction reduces the dry bias seen when comparing SMAP data to in situ data from the core validation sites. At L-band frequency, the contributing soil depth of microwave emission (or penetration depth) may be slightly different from the pre-defined discrete soil depths at which the soil temperatures are available from a land surface model. The resulting discrepancy will lead to dry bias of retrieved soil moisture (i.e., retrieval lower than in situ soil moisture) if the model-based effective soil temperature is colder than the soil temperature sensed by the radiometer. Conversely, wet bias of retrieved soil moisture will occur if the model-based effective soil temperature is warmer than the soil temperature sensed by the radiometer. C = 0.246 for a.m. soil moisture retrieval and 1.000 for p.m. soil moisture retrieval, K = 1.000 for the MODIS International Geosphere-Biosphere Programme (IGBP) land cover classes 1 through 5 (dense vegetation classes) and 1.020 elsewhere. Tsoil1 refers to the average soil temperature for the first soil layer (0-10 cm) and Tsoil2 refers to the average soil temperature for the second soil layer (10-30 cm) of the GMAO GEOS-5 land surface model, also known as the Global Modeling and Assimilation Office (GMAO) Goddard Earth Observing System Model, Version 5 (GEOS-5). Given results from SPL2SMP Calibration/Validation (Cal/Val) analyses, the SCA-V algorithm seems to deliver better performance than the SCA-H algorithm, which was designated as the pre-launch baseline retrieval algorithm. For this reason, the SCA-V is designated as the current baseline algorithm for the validated release of SPL2SMP. However, all five algorithms will be continuously assessed; the choice of the operational algorithm for the validated release of the product will be evaluated on a regular basis as analyses of new observations and Cal/Val data become available, and algorithm parameters are tuned based on a longer SMAP radiometer brightness temperature time series record. All five algorithms operate on the same zeroth-order microwave emission model commonly known as the tau-omega model. In essence, this model relates brightness temperatures (SMAP L1 observations) to soil moisture (SMAP L2 retrievals) through ancillary information (e.g. soil texture, soil temperature, and vegetation water content) and a soil dielectric model. The algorithms differ in their approaches to solve for soil moisture from the model under different constraints and assumptions. The following sections provide summarized descriptions of each algorithm. Further details are provided in O'Neill et al., 2016. In the SCA-V, the vertically polarized brightness temperature (TB) observations are converted to emissivity using a surrogate for the physical temperature of the emitting layer. The derived emissivity is corrected for vegetation and surface roughness to obtain the soil emissivity. The Fresnel equation is then used to determine the dielectric constant from the soil emissivity. Finally, a dielectric mixing model is used to solve for the soil moisture given knowledge of the soil texture. Analytically, SCA-V attempts to solve for one unknown variable (soil moisture) from one equation that relates the vertically polarized TB to soil moisture. Vegetation information is provided by a 13-year climatological data base of global Normalized Difference Vegetation Index (NDVI) and a table of parameters based on land cover and polarization. The SCA-H is similar to SCA-V, in that the horizontally polarized TB observations are converted to emissivity using a surrogate for the physical temperature of the emitting layer. The derived emissivity is corrected for vegetation and surface roughness to obtain the soil emissivity. The Fresnel equation is then used to determine the dielectric constant. Finally, a dielectric mixing model is used to obtain the soil moisture given knowledge of the soil texture. Analytically, SCA-H attempts to solve for one unknown variable (soil moisture) from one equation that relates the horizontally polarized TB to soil moisture. Vegetation information is provided by a 13-year climatological data base of global NDVI and a table of parameters based on land cover and polarization. In each iteration step, the soil moisture and vegetation opacity are adjusted simultaneously until the cost function attains a minimum in a least square sense. Similar to SCA-V and SCA-H, ancillary information such as effective soil temperature, surface roughness, and vegetation single scattering albedo must be known a priori before the inversion process. Unlike Microwave Polarization Ratio Algorithm (MPRA), DCA permits polarization dependence of coefficients in the forward modeling of TB observations. As implemented for the Version 2 Beta release, the H and V parameters are set the same. During the intensive Cal/Val period leading up to release of the Version 3 Validated SPL2SMP data, implementing polarization dependence for the tau-omega model parameters was investigated. The MPRA is based on the Land Parameter Retrieval Model (Owe 2015) and was first applied to multi-frequency satellites such as AMSR-E. Like DCA, MPRA attempts to solve for soil moisture and vegetation optical depth using the vertically and horizontally polarized TB observations. However, it does so under the assumptions that (1) the soil and canopy temperatures are considered equal, and (2) vegetation transmissivity (γ) and the single-scattering albedo (ω) are the same for both H and V polarizations. When these assumptions are satisfied, it can be shown that the soil moisture and vegetation optical depth can be solved analytically in closed form, resulting in the same solutions as would be obtained iteratively using DCA. Similarly to DCA, ancillary information such as effective soil temperature, surface roughness, and vegetation single scattering albedo must be known a priori before the inversion process. In each iteration step, soil moisture and vegetation opacity are adjusted simultaneously until the cost function attains a minimum in a least square sense. It is clear that when both Φ_DCA^2 and Φ_(E-DCA)^2 attain their theoretical minimum value (i.e. zero) in the absence of uncertainties of modeling, observations, and ancillary data, T_(B,v)^obs = T_(B,v)^est and T_(B,h)^obs = T_(B,h)^est, implying that DCA and E-DCA converge to the same solutions. The advantage of E-DCA over DCA, however, is apparent when in reality there is finite uncertainty (e.g., a dry bias associated with the ancillary soil temperature data); this uncertainty will be cancelled from the numerator and denominator in the calculation of the normalized polarization difference in Φ_(E-DCA)^2, leaving such uncertainty affecting only one component of the cost function instead of two components as in Φ_DCA^2. This reduction in the impact of soil temperature uncertainty on soil moisture retrieval should make E-DCA more tolerant of soil temperature uncertainty, resulting in fewer instances of retrieval failure than DCA. At present, there are a few caveats associated with E-DCA: (1) its exact performance is being evaluated in the ongoing Cal/Val activities, and (2) the choice of the horizontally polarized TB in the formulation is subject to further assessment as analyses of new observations and Cal/Val data become available. This product is generated by the SMAP Science Data Processing System (SDS) at the Jet Propulsion Laboratory (JPL). To generate this product, the processing software ingests the 6:00 a.m. descending and 6:00 p.m. ascending half-orbit files of the SMAP L1C Radiometer Half-Orbit 36 km EASE-Grid Brightness Temperatures, Version 4 product. The ingested data are then inspected for retrievability criteria according to input data quality, ancillary data availability, and land cover conditions. When retrievability criteria are met, the software invokes the baseline retrieval algorithm to generate soil moisture retrieval. Only cells that are covered by the actual swath for a given projection are written in the product. Anthropogenic RFI, principally from ground-based surveillance radars, can contaminate both radar and radiometer measurements at L-band. The SMAP radar and radiometer electronics and algorithms include design features to mitigate the effects of RFI. The SMAP radiometer implements a combination of time and frequency diversity, kurtosis detection, and use of thresholds to detect and, where possible, mitigate RFI. Level-2 radiometer data can also contain bit errors caused by noise in communication links and memory storage devices. Consultative Committee on Space Data Systems (CCSDS) packets include error-detecting Cyclic Redundancy Checks (CRCs), which are used to flag errors. More information about error sources is provided in Section 4.6: Algorithm Error Performance of the ATBD (O'Neill et al. 2018). Each HDF5 file contains metadata with Quality Assessment (QA) metadata flags that are set by the Science Data Processing System (SDS) at the JPL prior to delivery to the National Snow and Ice Data Center Distributed Active Archive Center (NSIDC DAAC). A separate metadata file with an .xml file extension is also delivered to NSIDC with the HDF5 file; it contains the same information as the HDF5 file-level metadata. A separate QA file with a .qa file extension is also associated with the HDF5 file; it contains useful statistics such as the percentage of elements having various quality conditions. If a product does not fail QA, it is ready to be used for higher-level processing, browse generation, active science QA, archive, and distribution. If a product fails QA, it is never delivered to NSIDC DAAC. The information in the following sections has been adapted from O'Neill et al. (2016). Data from both 6:00 a.m. descending and 6:00 p.m. ascending half-orbit passes are used as input for soil moisture derivation in this Version 4 Validated product. However, the radiometer soil moisture algorithm assumes that the air, vegetation, and near-surface soil are in thermal equilibrium in the early morning hours; thus, retrievals from 6:00 p.m. ascending half-orbit passes may show a slight degradation in quality. Nonetheless, ubRMSE (unbiased root mean square error) and correlation of the p.m. and a.m. retrievals are relatively close. Bit flags generated from input SMAP data and ancillary data are also employed to help determine the quality of the retrievals. Ancillary data help determine either specific aspects of the processing, such as corrections for transient water, or the quality of the retrievals, such as the precipitation flag. These flags provide information as to whether the ground is frozen, covered with snow, flooded, or whether it is actively precipitating at the time of the satellite overpass. Other flags will indicate whether masks for steeply sloped topography, or for urban, heavily forested, or permanent snow/ice areas are in effect. Unless otherwise stated, all areal fractions defined below refer to 36 x 36 km2 inversion domain. The flags described below, for example, are used in the surface_flag. Refer to Table 5 of the Data Fields page for more details. If water fraction is 0.00–0.05, then retrieve soil moisture, but flag for recommended quality. If water fraction is 0.05–0.50, then retrieve soil moisture and flag for uncertain quality. If water fraction is 0.50–1.00, then flag, but do not retrieve soil moisture. The SMAP precipitation flag is set based on either forecasts of precipitation or using data from the Global Precipitation Mission (GPM). It is a binary precipitation/no precipitation flag which indicates the presence or absence of precipitation in the 36 km grid cell at the time of the SMAP overpass. The presence of liquid in precipitation incident on the ground at the time of the SMAP overpass can adversely bias the retrieved soil moisture due to its large impact on SMAP brightness temperatures, as precipitation in the atmosphere is part of the atmospheric correction done in Level-1B brightness temperature processing. Unlike other flags, soil moisture retrieval will always be attempted even if precipitation is flagged. However, this flag serves as a warning to the user to view the retrieved soil moisture with some skepticism if precipitation is present. If precipitation is 0–1 mm/hr, then retrieve soil moisture, but flag for recommended quality. If precipitation is 1–25.4 mm/hr, then flag for uncertain quality and retrieve soil moisture. If precipitation is above 25.4 mm/hr, then flag, but do not retrieve soil moisture. If snow areal fraction is 0.00–0.05, then retrieve soil moisture, but flag for recommended quality. If snow areal fraction is 0.05–0.50, then flag for uncertain quality and retrieve soil moisture. If snow areal fraction is above 0.50, then flag, but do not retrieve soil moisture. The frozen ground flag is set from either 1) the flag passed through from the SMAP radiometer freeze/thaw algorithm, or 2) from modeled surface temperature information (Tsurf) from the Global Modeling and Assimilation Office (GMAO). These sources for the frozen ground flag are contained in the SPL2SMP product and are reflected in bits 7 and 8 of the surface_flag (bit 7: SMAP radiometer-derived freeze/thaw state; bit 8: GMAO Tsurf). For this SPL2SMP Version 5 product, GMAO Tsurf (bit 8) is used to determine frozen ground condition. If frozen ground areal fraction is 0.00–0.05, then retrieve soil moisture, but flag for recommended quality. If frozen ground areal fraction is 0.05–0.50, then flag for uncertain quality and retrieve soil moisture. If frozen ground areal fraction is 0.50–1.00, then flag, but do not retrieve soil moisture. If urban areal fraction is 0.00–0.25, then retrieve soil moisture, but flag for recommended quality. If urban areal fraction is 0.25–1.00, then flag for uncertain quality and retrieve soil moisture. If urban areal fraction is above 1.00, then flag, but do not retrieve soil moisture. Large and highly variable slopes present in the radiometer footprint will adversely affect the retrieved soil moisture. The SMAP mountainous area flag is derived from a combination of high elevation information from the DEM coupled with a statistical threshold based on the slope variability within each 36 km grid cell. If slope standard deviation is 0.0–3.0°, then retrieve soil moisture, but flag for recommended quality. If slope standard deviation is 3.0°–6.0°, then flag for uncertain quality and retrieve soil moisture. If slope standard deviation is above 6.0°, then flag, but do not retrieve soil moisture. For in-depth details on all data flags, refer to the Data Fields document. For a detailed description of the SMAP instrument, visit the SMAP Instrument page at the Jet Propulsion Laboratory (JPL) SMAP website. For tools that work with SMAP data, see the Tools web page. Brodzik, M. J., B. Billingsley, T. Haran, B. Raup, and M. H. Savoie. 2014. Correction: Brodzik, M. J. et al. EASE-Grid 2.0: Incremental but Significant Improvements for Earth-Gridded Data Sets. ISPRS Int. J. Geo-Inf 2012. 1(1):32-45 ISPRS Int. J. Geo-Inf. 3(3):1154-1156. https://dx.doi.org/10.3390/ijgi3031154. Chan, S., R. Bindlish, P. O'Neill, E. Njoku, T. Jackson, A. Colliander, F. Chen, M. Mariko, S. Dunbar, J. Piepmeier, S. Yueh, D. Entekhabi, M. Cosh, T. Caldwell, J. Walker, X. Wu, A. Berg, T. Rowlandson, A. Pacheco, H. McNairn, M. Thibeault, J. Martinez-Fernandez, A. Gonzalez-Zamora, M. Seyfried, D. Bosch, P. Starks, D. Goodrich, J. Prueger, M. Palecki, E. Small, M. Zreda, J. Calvet, W. Crow, and Y. Kerr. 2016. Assessment of the SMAP Passive Soil Moisture Product. IEEE Trans. Geosci. Remote Sens. 54(8):4994-5007. https://dx.doi.org/10.1109/TGRS.2016.2561938. Chan, S. K., R. Bindlish, P. O'Neill, T. Jackson, E. Njoku, S. Dunbar, J. Chaubell, J. Piepmeier, S. Yueh, D. Entekhabi, A. Colliander, F. Chen, M. H. Cosh, T. Caldwell, J. Walker, A. Berg, H. McNairn, M. Thibeault, J. Martiinez-Fernandez, F. Uldall, M. Seyfried, D. Bosch, P. Starks, C. Holifield Collins, J. Prueger, R. van der Velde, J. Asanuma, M. Palecki, E. E. Small, M. Zreda, J. Calvet, W. T. Crow, Y. Kerr, 2018. Development and assessment of the SMAP enhanced passive soil moisture product, Remote Sensing of Environment, 204: 931-941. https://doi.org/10.1016/j.rse.2017.08.025. Choudhury, B. J. and T. J. Schmugge. 1982. A Parameterization of Effective Soil Temperature for Microwave Emission. Journal of Geophysical Research. 87(C2):1301-1304. Jet Propulsion Laboratory (JPL). "SMAP Instrument." JPL SMAP Soil Moisture Active Passive. https://smap.jpl.nasa.gov/observatory/instrument/ [20 August 2015]. NASA EOSDIS Land Processes DAAC. 2015. Land Water Mask Derived from MODIS and SRTM L3 Global 250m SIN Grid. Version 005. NASA EOSDIS Land Processes DAAC, USGS Earth Resources Observation and Science (EROS) Center, Sioux Falls, SD. (https://lpdaac.usgs.gov/dataset_discovery/modis/modis_products_table/mod44w), [20 August 2015]. Owe, M., De Jeu, R. A. M., and Walker, J. P. 2015. A Methodology for Surface Soil Moisture and Vegetation Optical Depth Retrieval Using the Microwave Polarization Difference Index. IEEE Transactions on Geoscience and Remote Sensing, 39(8):1643–1654, 2001. Piepmeier, J. R., D. G. Long, and E. G. Njoku. 2008. Stokes Antenna Temperatures. IEEE Trans. Geosci. Remote Sens. 46(2):516-527. Rautiainen, K., J. Lemmetyinen, M. Schwank, A. Kontu, C. Ménard, C. Mätzler, M. Drusch, A. Wiesmann, J. Ikonen, and J. Pulliainen. 2014. Detection of soil freezing from L-band passive microwave observations. Remote Sensing of Environment 147:206–218. Roy, A., A. Royer, C. Derksen, L. Brucker, A. Langlois, A. Mialon and Y. Kerr. 2015. Evaluation of spaceborne L-band radiometer measurements for terrestrial freeze/thaw retrievals in Canada. IEEE Journal of Selected Topics in Applied Earth Observations and Remote Sensing https://dx.doi.org/10.1109/JSTARS.2015.2476358. How do I interpret the surface and quality flag information in the Level-2 and -3 passive soil moisture products?